Remember the smash hit drama Last Flight to Abuja by Obi Emelonye? Well, the acclaimed director has partnered with Rok Studios for his latest project and recently completed filming Thy Will be Done, with Nollywood royalty Mercy Johnson-Okojie, Ramsey Nouah and Mary Njoku. 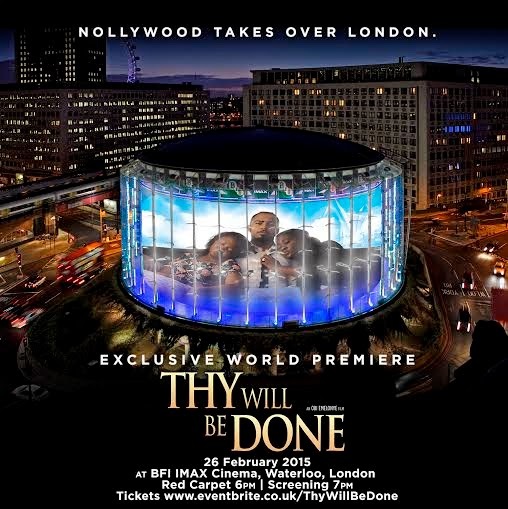 I hear that Mercy Johnson and Mary Njoku are flying in to London for the glitzy, star-studded premiere at the incredible 500-seat BFI IMAX in Waterloo, London on Thursday 26 February - tickets for the big night are here but are selling fast, sources tell me. If you are in London on this day, you better don't dull - this is definetely a place be. Nollywood goes global! Pius (Ramsey Noah) is a happily married pastor in charge of a large church in Lagos, Nigeria. But when his first wife (Mary Njoku) that he buried 7 years ago suddenly shows up, his world is thrown into turmoil. His present wife (Mercy Johnson-Okojie) tries to fight her corner but Pius has a choice to make...between his calling and his wives; between old sins and new loyalties; between taking firm action and surrendering to God's will.